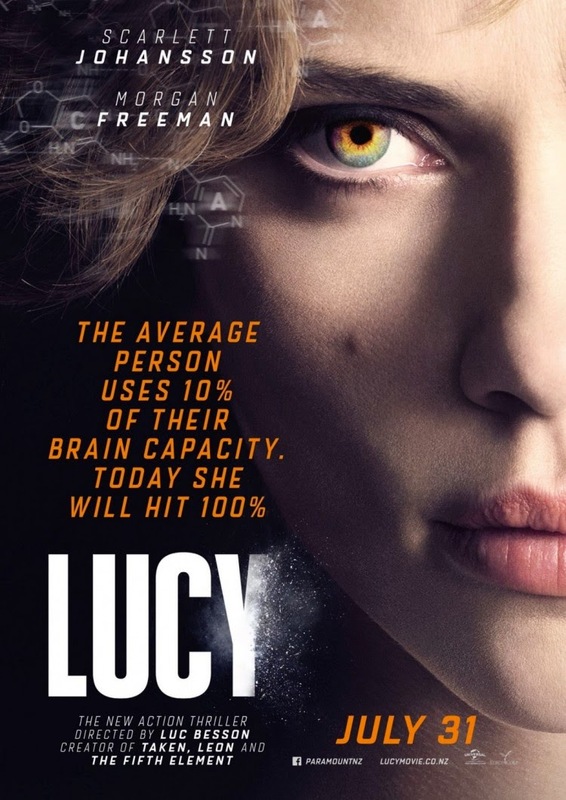 From the director and creator of some of the past’s most iconic movies that have their own cult following, comes Lucy. If you don’t know who Luc Besson is then you’re probably not that big of a movie fan. Yes, he’s done some pretty bad movies but his good ones are still talked about and like I said have loyal fans that will watch it again and again. Movies like Léon: The Professional, La Femme Nikita and The Fifth Element. I love his good movies and his not so good movies well you just don’t remember them. But even if you haven’t seen movies that he’s directed you’ve probably seen at least one that he’s written or had a hand in their creation. Go look him up on IMDB, you’ll be surprised. Anyway on to the movie Lucy. The entire premise of the story is about the human mind. How we only use 10% of it even at the best of situations, even when you’re some kind of genius. So what happens when you are very suddenly able to use all 100% of it? Or what happens as your brain slowly begins to use more than that 10%? Interesting, right? Well, being the crazy and creative “genius” that he is, Besson tries to guess at it in this movie. In the most extreme way possible in some cases. Now if you’ve looked up this movie on IMDB or Rotten Tomatoes or whatever your favourite movie site is you’ll probably notice that reviews of it are pretty much split down the middle. Some will like it and some won’t. I can see both sides of this divide. At times you won’t know what this movie is about or more specifically what this movie is trying to make you think it is. It seems to start normal enough with an opening exposition narrated by LUCY showing a hominid having a drink by a river. (Bonus fact: the earliest and most complete skeleton of an ape-like creature that walked on two feet like us and is considered human’s earliest ancestor was given the name Lucy.) After which you see how the main character Lucy, gets into the whole mess she ends up with. The moment you see a short clip of a white mouse near a mousetrap with a piece of cheese on it then you realize that you’re in for something different. And from that moment on Besson begins barraging you with everything he can pull out of his bag. This movie from start to finish is a non-stop barrage on your mind and your senses. Images come and go as fast as you can process them. Ideas both scientific and pseudo-scientific are hurled at you like a hail of arrows. It’s almost relentless. There’s Korean mafia lead by a Mr Jang played brilliantly by Choi Min-Sik who is a cold and ruthless leader trying to get a brand new drug into the market. Then you go through the changes that Lucy goes through when she overdoses on the drug. In between all this action you see Prof. Norman who speaks about his theories of the human mind and what reaching a 100% could mean. Then of course you see what abilities and powers Lucy begins to develop on the way to reaching 100%. Choi Min-Sik. As mentioned above he’s the head of the Korean gang in this movie that is trying to unleash a new synthetic drug on the world. The man is good. You believe that he’s a ruthless and methodical killer. He may be the boss but he’s a hands on one and incredibly vicious. When things go wrong he wants to be there to sort it out. Professor Norman played by Morgan Freeman. What’s not to like? It’s Morgan Freeman. He plays the Professor beautifully. He may not have a huge role in it but it’s an important one and after watching him I can’t imagine anyone else playing the role. He emotes his lines so well. Scarlett Johansson. Her performance is pretty good. Didn’t have much I didn’t like about it. Going from a scared girl caught in a situation she has no control over to one who’s brain is slowly expanding, evolving. Where with every percent she gains she becomes more aloof, becoming a cerebral being more than an instinctual one. The car chase scene. This is pretty good. Not Bourne movie good but pretty good. After all Luc Besson did all those Taxi movies and they’re all about cars getting somewhere fast or being chased around really fast through crowded streets. Lucy’s developing ability. It goes from, “Hmmm... that’s interesting” to “Whoa! That’s pretty cool!” to “What?! That’s just ridiculous now.” Seriously. I mean, brain expands so your brain/mind can control your body. That’s interesting. Control pain, metabolism, full and complete memory recall, I can see how that’s possible. Telekinesis/Psychokinesis and mind reading? Pretty cool. But then her ability goes beyond that, and that’s when it gets ridiculous. I won’t spoil it for you. Best you watch it for yourself. It’s better this way. The other thing I found ridiculous was the product placement. So yes the main baddies in this movie are Koreans but the movie takes place in Taiwan first then on to Paris. But there are Samsung products everywhere! And it’s not even subtle. It’s in your face! The smartphones they use, every screen in any scene, even office equipment. Anytime there’s a Samsung product to showcase you can be sure that the Samsung logo can clearly been seen. This is not the first time this has happened in a movie that Luc Besson has been involved in and maybe it isn’t as bad (I’m looking at you Transporter 2 and Audi), but it’s not good either when you can spot it so easily. Lucy the movie to me has that Japanese Anime feel to it. I felt the same way about his other Sci-FI movie, The Fifth Element. If you watch a lot of animes whether it be series or movies, especially Sci-Fi themed ones, you’ll understand what I’m talking about. There’s always an underlying philosophy to either the good guy or bad guy or whatever it is they’re going through something that pushes them or guides them or the story. And that philosophy always links back to the human condition. There’s also always an exaggerated element whether it be the situation or the individual. The Fifth Element had the end of the world at the hands of an immortal alien presence that can only be thwarted by a perfect being. Lucy has, well Lucy who’s brain expands and evolves to develop powers that go beyond the ridiculous at times. Watch any anime and you’ll see the same thing. In fact, I’m thinking Akira by Katsuhiro Otomo. Think of Lucy as a live-action anime by a Frenchman. So to sum it up. I liked Lucy. It’s possibly the shortest movie you’ll see this year or among the summer action blockbusters at a mere 90 minutes but if you allow yourself to enjoy it it’ll be an entertaining one. Think too hard about what’s going on, try to analyze and separate the science from the pseudo-science mumbo jumbo or even balk at the action, the visual effects or Lucy’s abilities and you’ll probably ruin it. If you want to know about human evolution or the evolution of the human brain and what it would mean to be able to use more than 10% then go Google it and read up on actual scientific papers and research. If you want to know more about the pseudo-science do the same thing. Don’t do it while watching this movie. If you want to pick apart the visual effects or Lucy’s ability then you should be doing it for all the Marvel movies or The Expendables 3. To enjoy this movie funnily enough is to not use your brain. Just go with it. Think of it as an adaptation of a comic book if you will or a manga if you’re a fan of manga and anime. Or just keep looking at Scarlett Johansson, that’s worth it too. If you do want to take away something then pay attention to two scenes. The first, when Lucy confronts Jang, listen to her monologue. It’s interesting. The second, when Lucy reaches out to Professor Norman, when she asks him what she should do about her abilities. I thought what was said in these scenes were worth pondering.